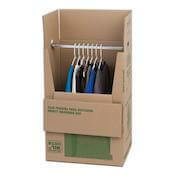 Need to buy moving boxes but don’t know where to start? We can help point you in the right direction as you prepare to move. 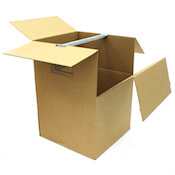 Whether you need boxes for an upcoming move or home renovation, or you’re finally constructing that box fort you’ve always dreamed of, Amazon, Walmart, Home Depot, and others sell boxes to fill those needs and many more. 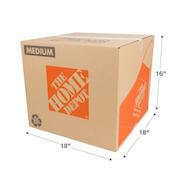 As one of the world’s largest online retailers, Amazon sells a wide variety of boxes at the click of a button. Whether you’re looking for a specific size or a specialty box to pack your large TV, you’ll likely find a box that fits your needs. Amazon has plenty of options, of course, but it’s also the best place to learn how each box holds up in the real world. Each item has a ton of customer reviews, which can help you decide if clicking the “buy now” button is actually a good idea. One thing to note: It doesn’t seem like Amazon will sell you just one box. So if you need only one or two boxes to pack your pantry one of our other recommendations may be a better choice for you. You can buy boxes without leaving your couch. Amazon Prime members receive free two-day shipping. Amazon delivers boxes right to your door (or wherever you choose). User reviews help you know you’re buying quality boxes. Walmart carries just about anything you need under one roof. Need tires? Go to Walmart. Need toe socks? Go to Walmart. 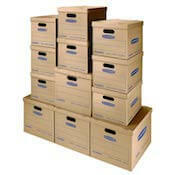 Need moving boxes? You get the picture. 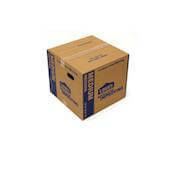 Walmart offers a large variety of moving boxes both online and in its stores. You also have the option to order your boxes on Walmart’s website and pick them up at your local store on the same day—an added level of convenience during a busy move or home renovation project. 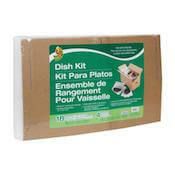 And, if you need other supplies for your move, you can pick those up at the same time. With more than 5,000 stores nationwide, you’ll likely find a Walmart close to home. Most stores are open 24/7, so you can grab more boxes at 4 a.m. on the day of your move. You can select your local store on Walmart’s website and browse in-stock inventory from home. Unlike Walmart, you can’t pick up your boxes and groceries at Lowe’s (unless you eat bird seed). Lowe’s does, however, carry a wide selection of tools, lumber, and home fixtures in addition to moving and packing supplies, which makes it a one-stop shop if you’re buying boxes to pack in conjunction with a big DIY project you’re tackling. Like Walmart, Lowe’s offers online ordering with in-store pickup, and you’ll find specialty boxes for packing up your clothes, dishes, and electronics. When shopping online, you can filter by items available at nearby Lowe’s locations and see what’s in stock on each product page. Lowe’s sells tools and materials for DIY projects. Home Depot offers many of the same benefits as Lowe’s, including a large selection of home improvement tools, but Home Depot’s online shopping experience stands out between the two. In addition to a large selection of moving boxes, the website shows you a visual representation of each box’s dimensions, how many boxes are in stock at your local store, and a project guide that covers basic moving and packing tips. 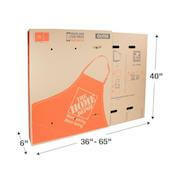 HomeDepot.com provides more product information than other retailers’ websites. It offers a basic moving guide to help you ensure you buy all the materials you need. You can order packing kits for specific house or apartment sizes that ship for free to your local store. Home Depot sells tools and materials for DIY projects. U-Haul is one of our top picks on our best moving truck rental company list—and if you’re planning to rent a truck from U-Haul for your DIY move, you might as well buy your boxes there too! 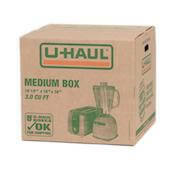 Like the other companies on our list, U-Haul has a large variety of moving boxes and kits that you can purchase both online and in-store. 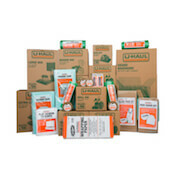 In addition to its selection of moving boxes, U-Haul also sells specialty supplies like storage bags and disposable moisture absorbers for preparing items for long- or short-term storage. 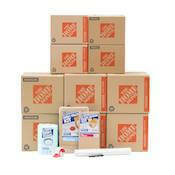 You can purchase moving kits and storage supplies in addition to boxes. Select items are cheaper with in-store pickup. Where will you buy your boxes? Let us know which retailer you picked in the comments below! Our readers would love to hear about your experience. 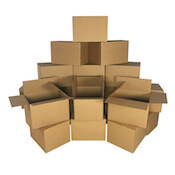 Are you buying boxes for an upcoming move? Check out our Find-a-Mover tool to easily compare the best moving companies in your area.